Should AirBNB and VRBO homes be eligible for Capital Gains Exemptions? The impact of online daily home booking websites like AirBnB and VRBO on Vancouver’s tight residential rental market appears to be significant and has attracted some academic scrutiny as of late. Daily rentals are not typically permitted as a residential use under existing city Land Use Zoning; they typically contravene Strata Bylaws; and they dodge the normal protections renters enjoy under the Residential Tenancy Act. Are services like Air BnB and VRBO also dodging significant taxes? Recent reports from reputable news media like the CBC suggest that many Air BnB hosts may not be reporting income. Air BnB advertises that hosts can make significant sums annually renting out a suite or single rooms ($34,320/year on average for a Vancouver 1 bed suite). Various advisory sites caution hosts on the need to report income for tax purposes. They also note that hosts can deduct expenses pro-rated on the number of rooms or area that they rent out, but something here seems a bit out of order as well though: can a person who infrequently rents one of two rooms write off 40% of their annual rent or heat or strata fees as expenses merely because they post availability and rent out a room one or two nights a month? Hmmmm. It’s a slippery slope. Is Revenue Canada adequately monitoring these businesses? A recent story from CBC here: http://www.cbc.ca/news/business/taxes/airbnbers-and-uber-drivers-be-warned-your-income-is-taxable-1.2969158 suggests that Air BnB hosts ARE being monitored, but to what degree? Should homes rented out on Air BnB and VRBO be eligible for valuable Capital Gains Exemptions intended for owners who occupy their home as their primary residence? Again, it would be interesting to see if anyone is cross-checking. Fare Evasion? Is the $700m enough for Metro Van? The Vancouver Sun reports some modest movement on Transit funding for Metro Vancouver. Now we’ll see the degree to which planning, funding and decision making is shared with Metro Vancouver. Regional mayors previously forwarded a $7.5 billion 10-year transit plan, however, funding for major projects like the Surrey LRT and the Broadway corridor subway is still missing. It appears this funding hinges on the re-election of the federal Liberals in October 2019 …. more than 3 years away. the demonstrated money losing performance of the recently replaced Port Mann bridge. If Socio-economic analysis was like climbing Everest, I’d want to be on the same climbing rope as demographer David Baxter. Founder of the Urban Futures Institute , mentor to many, and longtime analyst of Vancouver’s changing scene, David has more “re-fired” rather than retired. To wit, he’s recently published four very interesting research and analysis papers (on his website here and cited below) that deserve consideration in any debate on Vancouver’s housing future. They’re fulsome, factual and engaging – a must read for anyone who wants to have an informed conversation on the current debate. In “Land Supply: Scarce means Dense and Expensive, April 2016“ (click here) Baxter cites a 1975 Liveable Region study which illustrates our dilemma: we have a limited and finite land supply. The urban regions of Montreal and Toronto can (and have) expanded beyond 35 miles from their cores. In contrast, Greater Vancouver – hemmed in by mountains, ocean and the US border – cannot. Land prices and density in Greater Vancouver will be greater than those in any other region in Canada. In “Prices Crises: Costs and Benefits of Reducing Housing Prices, April 2016“ (click here) David explores the idea of “affordable” housing in a region that has historically been unaffordable. Baxter concludes that rather than market-wide interventions, Federal, Provincial and Local governments should be seeking price stability and instead target assistance to those who need it most. Want to live close to work? Some do and some don’t. Many households have working heads who are employed in different cities. Baxter takes a critical look at our regional focus and perhaps our over-emphasis on the role of the City of Vancouver and it’s proportion of housing stock and capacity. He notes that Vancouver has more than its per capita share of regional jobs, and that people who want to live close to work will continue to bid up house prices in Vancouver (for proximity and for other lifestyle benefits). He argues that we need higher density forms of development if we want greater affordability, but we should expect that competition [and prices] for these in high amenity city centres will always be higher. I do think we need a regional approach to the problem of accommodating and moving the region’s population to respond to these challenges. Environmental and social sustainability and urban resilience compel us to strive for a mix of housing in ALL regional centres. Vancouver for example will not have only top tier jobs but also a mix of other important and much needed services performed by people who earn less. I think we need to be careful of disturbing existing stocks of affordable housing and that we can involve citizens, designers and developers to enable a range of higher intensity forms of infill housing that a) fit and complement our neighbourhoods and b) are highly viable for development. Design & Development Creativity and Public Involvement needed for affordable market housing solutions for families. My attention was drawn to this today in the Vancouver media about the lack of 3+ bedroom units in Metro Vancouver: “Baby’s Crib-In-The-Bathroom Campaign highlights Vancouver’s Housing Crisis.” [CTV News]. “Generation Squeeze” is the group representing the people affected by this market shortage / shortfall. I think that we are going to hear much more from consumers whose needs are NOT being met by the market, and we are collectively going to need to respond to meet those needs. We need to tap the deep creativity of our design, development, and planning communities and involve families in the search for more affordable “market” family housing solutions. I am imagining a “Compact 3 Bed” Design Competition with actual demonstration suites mocked up, say in front of the Vancouver Art Gallery for a month so that the public and politicians can view the units and give and receive feedback. The mock-ups can explain all of the projected costs for each unit, design features, by-law conflicts and other trade-offs. The case studies can also explore WHERE we can build more to increase the supply in the face of low rental vacancies and for-sale availability of 3+ bedroom units. This has been done before. From my planning and development experience here in London UK, here’s a 2 Bedroom Design competition I reported on earlier this year – run by Marc Vlessing’s innovative firm Pocket Development. 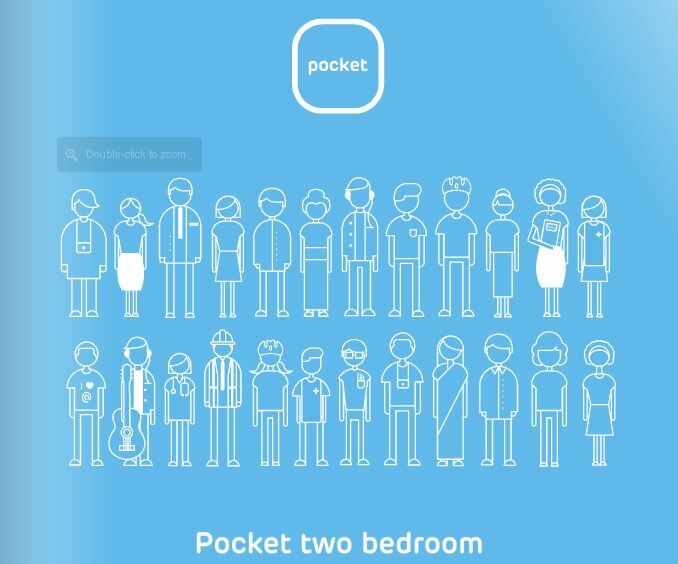 The Greater London Authority recently funded Pocket to run pilot programs for compact affordable housing in London. The End of Gazumping in England? Living and working outside of Canada opens your eyes to what really works at home. This story is illustrative of that. Canadians should be very proud of our efficient contract law system, particularly our tidy standard Agreements of Purchase and Sale that offer property buyers and sellers clarity and certainty on real estate purchases. (One might also add to this list the rational mortgage lending practices of Canadian banks and the mandatory underwriting of high-ratio loans by CMHC). We have good legal and finance systems in Canada that support a relatively accessible and fluid housing supply of new and resale housing. This is something the UK lacks to the point where I think it is a major impediment to the supply of new housing (because someone buying a new property must have certainty that they have a binding deals to purchase the new one and sell their old one!). To wit – and as a point of great contrast between systems in Canada and the UK – when I ask my English colleagues, “how long do you think it took to get a binding deal on my last property purchase offer in Vancouver?” they invariably give me a questioning answer in the range of “X months?”. Their slack-jawed reaction is always priceless when I tell them, “12 hours from offer submission to binding acceptance!” This is usually followed by much head-shaking discussion on the insanity of the UK property contract law. I first learned about the discrepancies in our systems from a Canadian lawyer Bob Aaron who posted more than a decade ago a story with the cheeky title “No Gazumping please, we’re Canadian“. It’s a peculiarity of English property law that any agreement to purchase a house or flat (or a development assembly for that matter) in England and Wales will remain open until “contracts are exchanged”. A buyer just does not have any certainty that she or he has a firm and binding deal until the very last minute. A seller can accept a higher bid at any point before contracts are exchanged (the purchaser has been “Gazumped”). More rarely, a seller can reduce their offer, perhaps if they’ve discovered some physical or title defect (the seller has been “Gazundered”). In Canada, the agreement of purchase and sale is binding at the time the agreement is executed, subject to terms agreed within the agreement (see the APS link above for a sample contract). The other important backstop to these agreements is the legal concept of specific performance, which means that the purchaser must complete on the agreement; if they do not, their liability is not limited to the down-payment. Purchasers who default on the agreements are also liable for any damages and additional costs the seller must bear to re-sell the property. Invariably, in the chronically under-supplied sellers’ market that has defined London for more than a decade , it’s always the case that buyers get gazumped. Adding insult to injury, the jilted purchaser has probably invested significant sums to inspect the property, review legal documents (land leases and party wall agreements etc. ), and to check land titles back to the Norman Domesday Book of 1086! The lack of a simple, binding purchase and sale agreement is a major frustration in England and I think that it invariably ratchets up the price of property. Somewhere around 18% of British housing purchase agreements collapse – annually, that represents 200,000 agreements on slightly more than a million total transactions – and a major reason is Gazumping. The emotional toll is expensive too! A colleague of mine recently had to go through months and months of terrible anxiety and uncertainty as she worked her way through the purchase of a flat. Unnecessary stress as the seller vacillated and stalled on the exchange of information and documents to finally get to the final exchange of contracts. For developers trying to assemble multiple pieces of land for a project, the situation is even more dire because they have to manage multiple offers and lengthy contract negotiations with the same risks that any one of the properties they have put purchase offers on will be Gazumped! The “bone-in-the-throat” land parcel in the centre of an assembly could hold the whole development hostage in the absence of binding agreements of purchase and sale. The move to binding agreements and a simplified purchase system may be around the corner with the story reported in the London Telegraph yesterday (photo below). A rational legal purchase and sale system like Canada’s has been in force in Scotland for some time, showing there is some hope for the rest of the UK. Vancouver City Council approved the advancement of an Affordable Home Ownership PILOT program yesterday. Based largely on “Shared Equity” models of affordable housing drawn from the US and the UK, the program identifies sites along arterial roads well served by frequent transit systems and close to Local Shopping Areas (LSAs) as potential locations for 6-storey development provided they generate targeted affordability outcomes. “Inboard” sites within 100m of these sites would be eligible for 31/2 storey forms of development (stacked Townhouses, Rowhouses etc) provided they meet similar affordability targets. The policy map above appears to be a natural iteration/evolution of Commercial/Mixed-Use “C-2” and “C-3A” zoning on the streetcar grid that has defined much of our city for almost 130 years – a development template based on the dual logic of electric mass transit and pedestrian mobility, married to convenient local shopping. The notable hole in the grid above is of course the Cambie Street CanadaLine corridor which is the subject of more intensive forms of redevelopment, serviced by the rapid transit line. In my old neighbourhood at Main and 26th , I’ve seen a few new arterial buildings – built under existing zoning – that maintained great neighbourhood shopping in small stores at grade with new rental and ownership units above, notably the rental building at 28th Ave with the “East is East” restaurant and the new Liquor Store, and the BlueTree development on the NE corner of Main and King Edward Ave (which replaced a contaminated gas station). They’ve been positive additions to the community and they have added and retained valued local shops and services. Here in the UK where I currently work, the idea of shared equity housing has been around for quite a while, typically included in large redevelopment programs and in the redevelopment of Council-Owned or Housing Association-Managed Social Housing Estates. I think that what is also interesting about the program is the income mix and the degree to which the interests of Shared Equity owners are highly aligned with those of other owners. The challenge is to find the 20% or so “public equity” and to resolve the equity questions in how that public asset is shared. Provincial amendments to Vancouver’s City Charter are required for the City to enter into these agreements. This update on my recent post on Transit Oriented Development in Metro Vancouver is a great example of how embracing the creativity of citizens can help us to see our cities in new ways and inform discussions on how our cities and neighborhoods can evolve as more sustainable, liveable places. Michael Bloomberg, the former Mayor of NYC once famously stated: “In God we trust; all others bring data”. Well this experience suggests that if you ask, you shall receive! First Frances Bula tweeted about her trip around the Millennium Line; then I used Google Earth to capture images of land use within 800 m of the stations; then – less than 24 hours later – someone smarter than me runs Census data through a Geographic Info Systems application to generate population density maps for all stations! We all learn something in the process. Starting with my 800 m radius snapshots of neighbourhoods around our Millennium Line stations, Jens Von Bergmann ran some 2011 census data to give us some idea of the population density within 400 m and 800m for these stations (and more, including the Canada Line). His very interesting results are found here on his “Mountain Doodles” blog: see Link . Nice work Jens! And here is the table: Vancouver stations in blue organized by the most dense population within an 800 m radius according to Jens’ data.